At the top of Baiyoke Sky, the tallest tower in the Kingdom of Thailand. One of Thailand's most revered temples, Wat Pra Kaeo is located inside the grounds of the Grand Palace. This Royal temple contains an exquisite Emerald Buddha which dates back to around the 14th century. No one is allowed near the Buddha which is raised high on a series of platforms, except H.M. King. A seasonal cloak, changed three times a year to correspond to the summer, winter, and rainy season covers the statue. A very important ritual, the changing of the robes is performed only by the King to bring good fortune to the country during each season. One of Bangkok's most famous temples (and the one you will see on all the postcards after the Grand Palace.) It has an imposing spire (prang) over 70 metres high, beautifully decorated with tiny pieces of coloured glass and Chinese porcelain placed delicately into intricate patterns. You can no longer climb the steps to the top of the prang for those vertigo inducing views over the river but it's worth visiting. Wat Po is Bangkok's largest temple, famous for its huge and beautiful reclining Buddha 46 metres long and covered in gold leaf. The Buddha's feet are 3 metres long and exquisitely decorated in mother-of-pearl illustrations of auspicious laksanas (characteristics) of the Buddha. The headquarters of Thailand's largest monastic order and the home of Vipassana Meditation, Wat Mahathat is the most important centre for the study of Buddhism and meditation. Although most programmes are in Thai, there are some in English and the temple has become a popular place to learn the Vipassana meditation method. Wat Traimit has a wonderful solid gold seated Buddha nearly 5 metres high and weighing five and a half tons. In the past, artisans crafted the Buddhas in gold and disguised them from invading armies by a covering of stucco and plaster. The Buddha at Wat Traimit was discovered by accident when it was accidentally dropped as it was being moved, revealing, under a casing of plaster, a beautiful solid gold Sukhothai style Buddha. One of the oldest temples with a sweeping elegant roof and the site of the original Giant Swing ceremony. A huge teak arch - all that remains of the original Giant Swing lies in the grounds in front of the temple. The swing was used in a ceremony to give thanks for a good rice rice harvest. Chinatown is one of the most fascinating district in Bangkok. It's noisy and smelly and exhilarating. It's an area of dark laneways and traffic-choked roads, of bright, cheap markets and enticing foodstalls as far as the eye can see. Despite its grungy style Chinatown offers a wonderful glimpse into 300 years of cultural development. Thailand's National Museum is the largest museum in Southeast Asia and an excellent place to learn about Thai art. All periods and styles are represented, from Dvaravati to Ratanakosin, and there's also a well-maintained collection of traditional musical instruments from Thailand, Laos, Cambodia and Indonesia. This is a great spot to visit for authentic Thai residential architecture and Southeast Asian art. Located at the end of an undistinguished soi next to Khlong Saen Saeb, the premises once belonged to the American silk entrepreneur Jim Thompson, who deserves most of the credit for the worldwide popularity of Thai silk. A former 19th rice farmer's teak house transplanted from the banks of Chiang Mai's Ping River to Bangkok in 1964, Kamthieng House is now the headquarters of the the Siam Society - dedicated to preserving and promoting Thai culture and heritage. Uniquely Thai and quite spectacular. Eight of the Royal barges are on display. These magnificent boats are hand carved from huge pieces of teak with prows carved into mythical creatures, gilded in gold and intricately decorated with tiny shimmering pieces of glass. It is another very worthwhile day trip from Bangkok. Words can't truly describe how lifelike the images are and some of the figures are set in surroundings that make them surreal. One display includes all nine kings of the Chakri Dynasty, life sized, lifelike and in full regalia. For lovers of old planes, or it you're inbetween day flights at Don Muang airport. Includes a Spitfire, several Nieuports and Breguets, and the only Japanese Tachikawa apparently still in existence. Location Phaholyathin Road, near Wing 6 of the airport. Open Mon-Fri 8.30 am-4.30 pm. Bangkok is a cultural melting pot and there's no better evidence of this than Phahurat, on the edge of Chinatown. A wide variety of Indian goods are available in this small area, ranging from an astonishing array of silks to Thai shoulder bags. The choice is amazing, the haggling is fierce and the bargains can be unbelievable - if you're good enough, that is. Ancient City (Meuang Boran), south of Bangkok, is billed as the largest open-air museum in the world. Over 100 of Thailand's most impressive monuments are rendered slightly less impressive in this 80-hectare (200-acre) collection of scale models. 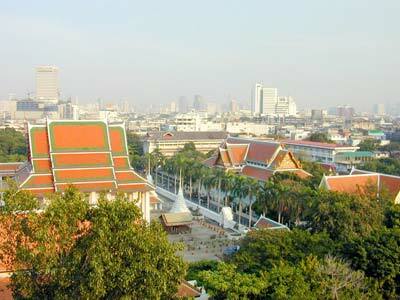 The grounds follow the basic shape of Thailand itself and the monuments are placed accordingly. A UNESCO World Heritage Site, Ayuthaya's historic temples are scattered throughout this once magnificent city and along the encircling rivers. Several of the more central ruins – Wat Phra Si Sanphet, Wat Mongkhon Bophit, Wat Na Phra Meru, Wat Thammikarat, Wat Ratburana and Wat Phra Mahathat – can be visited on foot. In the middle of the Mae Nam Chao Phraya at Bangkok's northern edge is Ko Kret, one of Thailand's oldest Mon settlements. From the 6th to the 10th centuries, the Mon people dominated Thai history and culture, and their ancient crafts still draw visitors from around the world. Pottery is the main claim to fame of the Mon and visitors to the island can visit the Ancient Mon Pottery Centre, which displays a wide variety of local earthenware. There are also plenty of opportunities to watch potters go about creating these fine examples of traditional handicraft. After ascending the throne in 1782 King Rama I moved the capitol across the Chao Phaya River from Thonburi to Bangkok. HM ordered the palace built to match the royal palace destroyed in the fall of Ayuttuya. It took three years to complete. The Grand Palace stands close to the river and includes a Royal Chapel which houses the Emerald Buddha and the royal residence. Much of Bangkok's history has evolved along the banks of the Chao Phraya river. Wending its way through the heart of Bangkok, it continues to play an important part in daily life. Every day you'll see commuters, saffron robed monks and school children speeding by on fast river taxis, overtaking the heavily laden rice barges making their sedate journey upriver. For the visitor, the river provides a contrast of the old and the new, with some of Bangkok's most revered temples standing alongside warehouses, old wooden houses, new residential blocks and prestigious five star hotels.